Historically, the flagship of the Birds Eye frozen food range was the clear segment leader, but for several years Fish Fingers had not been adding sufficient value to support a price premium. Ironically, over this same period, demand for fish and seafood was demonstrating explosive growth in all other formats including fresh, tinned, chilled and frozen. In the background, the Birds Eye product team had been working to improve the quality, taste and nutrition of the Fish Finger. The modern day Birds Eye Fish Finger carried an ‘all natural’ claim and was endorsed by the Heart Foundation and awarded the Heart Tick to reassure mums about the product’s healthiness – but it wasn’t being communicated to consumers. At a rational level, these improvements delivered against the need for product reinvention, but it wasn’t enough on its own: consumers weren’t getting it. The communication challenge was clear, we needed to deliver differentiation in order to rise above the category commoditisation, reassure mums of our real fish credentials and rekindle an emotional bond with the Birds Eye Fish Fingers brand. increase perceived brand value to justify a price premium. 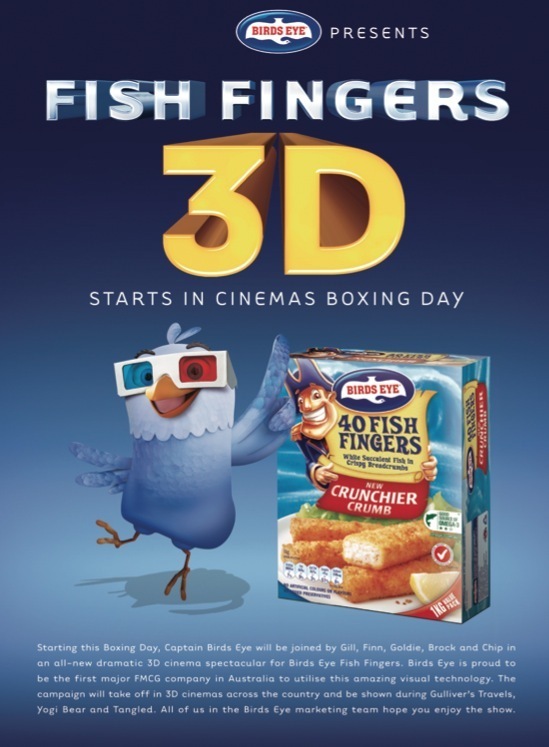 increase key measure of ‘Birds Eye Fish Fingers are made from real fish’ (currently sitting at 23% total impressions). The Simplot marketing team had committed a relatively modest budget to test the Fish Fingers theory and prove that advertising support could persuade consumers to not just reconsider Fish Fingers, but also pay a premium for Birds Eye. 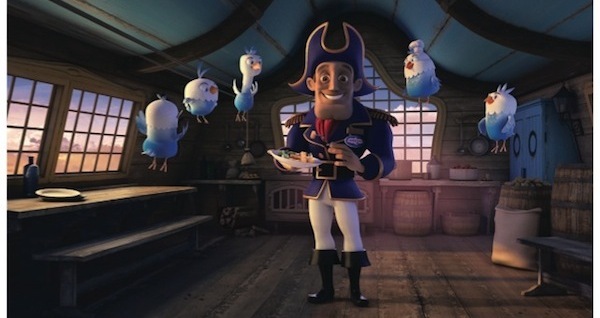 Although Captain Birds Eye was a strong figure in the past, an absence from TV for a decade gave him zero relevance for younger mums and their kids. Clearly, the Captain Birdseye of old wasn’t going to do it for them. We needed to rejuvenate the Captain in the same way Birds Eye had rejuvenated the product. What was engaging the hearts and minds of today’s young families? A chance cinema visit to see Avatar by a Belgiovane Williams Mackay strategy planner and his young family ignited a the idea: retelling old stories with new 3D wizardry. What could be more perfect? An ageing product in need of a refreshed image, a new and relevant story to tell, and an ageing animated character that could benefit from a bit of 3D technology. Even braver was our suggestion that we were going to launch using only one traditional media channel – cinema – and a small budget (under $500,000) for media and 3D production! The big idea… If you thought Birds Eye Fish Fingers were old school, think again. The logic seemed to speak for itself: mums and kids enjoying the same experience simultaneously. A simple story of a child entering the mystical land of Captain Birds Eye and his quest for the perfect Fish Finger. The blend of old tales and new technology, reflecting mum’s own nostalgia for the brand with the freshness of a new communication in a new format to a new generation. Our creative and media strategies were inextricably linked. An integral part of the commercial’s effectiveness was its ‘3D-ness’; equally, the media vehicle itself provided the context within which it could rekindle an emotional bond with its consumers. We had strategic confidence that our creative and media strategy would form a common bond between parent and child centred on the appeal of the brand. We believed that, as the first commercial of its kind, it would create enormous PR and make Birds Eye Fish Fingers ‘newsworthy’. We knew that the modernity of the technology would have a halo effect on the brand giving it renewed relevance. The campaign ran from 1 until 31 January 2011 on 500 screens around Australia. We achieved a 26% volume increase (versus our goal of 5%) without any price promotion. NB: this is based on actual Scan Data; i.e. sales to consumers, not weighted retailer stock. This equated to 211,750 units in the launch month versus the monthly average previously of 167,407 units, a 26.5% increase – the biggest increase in years. The increased dollar value of these sales represented a 76% return on every dollar invested in advertising. And sales are also up 16% YOY, initiated through the cinema launch period – importantly, an increase in unit sales greater in size and sustained effect than those previously achieved through heavy discounting. 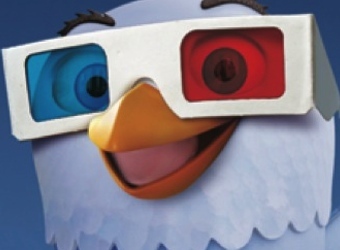 There was also a significant jump in share growth (and decrease in growth for our main competitor) during the initial cinema launch period, climbing from 59.15% to 64.45% market share (well above our target of 60% market share) during the four-week launch period and, importantly, this effect was sustained after the cinema campaign. We also achieved a great result in increasing the key measure for the new and improved Fish Finger product… that ‘Birds Eye Fish Fingers are made from real fish’. Total impressions after the initial launch campaign in January were 58%, a massive improvement on our last measure of 23%. It proved that we could change perceptions around the product and differentiate our quality over competitors. We also won a Silver Effie in the Best Small Budget under $500,000 category, as well as being a national finalist in the brand revitalisation category of the 2011 AMI Awards.